A photo of 375 Smith Street when it was the Court Street Theatre circa 1928. 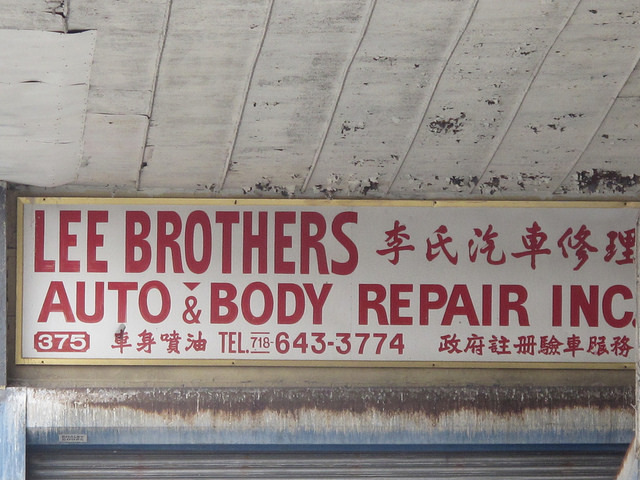 For the past few years, news has been circulating around Carroll Gardens that the Lee Brothers planned on closing their Auto Repair shop at 375 Smith Street at the corner of Third Street. 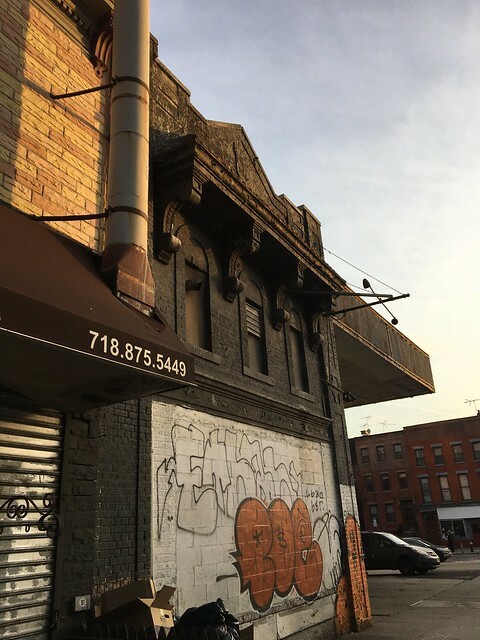 In 2014, the brothers filed plans with the NYC Department of Buildings for a new four story, 11 apartment residential building with retail space on the ground floor and a number of parking spots. Though this project obviously has been in the works for years, it has only now become official. 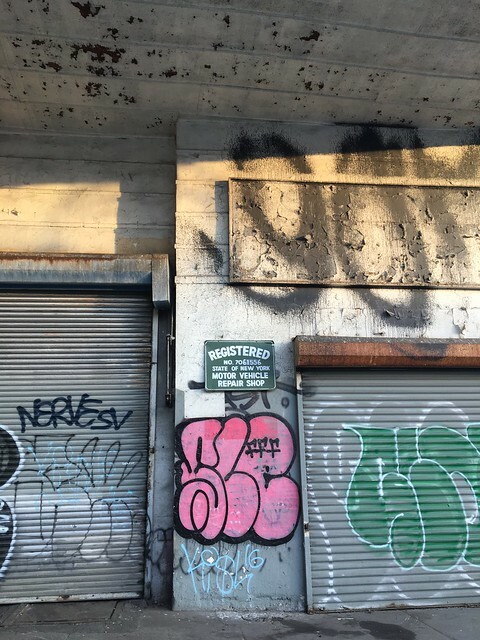 In the past two weeks, the Lee Brothers have told customers that they are no longer accepting work and that the construction project will begin soon. The garage sits on one of the largest and most desirable lots in one of the most coveted neighborhoods of Brooklyn. It is therefore not surprising that the owners have decided to develop it. 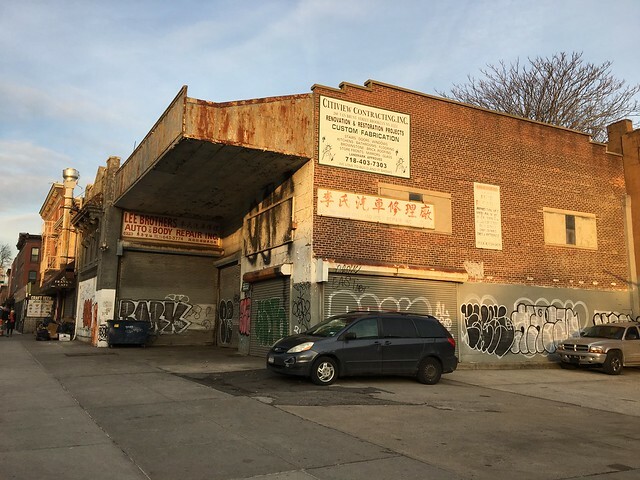 According to the Carroll Gardens contextual rezoning, which was approved in 2009, the site is in an R6B zone, with a height limit of 50 feet and a commercial overlay fronting Smith Street . 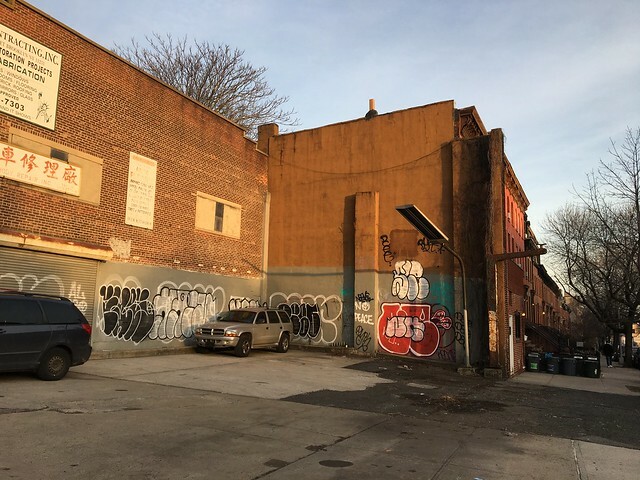 The Carroll Gardens community pushed for the contextual re-zoning and height limit in part because of the opposition to 360 Smith Street, the 70 feet building right across the street. 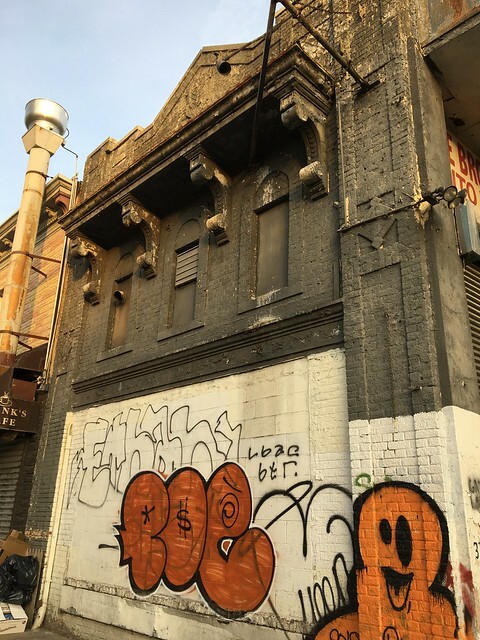 Though the Lee's auto repair shop site was not much to look at, it does include a sweet little building, constructed in the 1920's, that was once home to the Court Theatre, a neighborhood movie theatre, which had previously operated at 551 Court Street, hence the name. Some details of its past are still visible on parts of its façade. Here is a link to an old tax photo from 1928 that shows the theatre. Sometime in the 1940, the building was changed into a gas station. In the 1980's the pumps were taken out, but the repair and body shop remained. More on the building's history can be found here. Good. This will be a great improvement. Shame that the neighborhood downzoning means that a building literally on top of a mass transit station can not be bigger than that. I've always loved that building. I was hoping they'd turn it into a cool brewery or other hangout. The overhang would make for a great semi-covered outdoor dining area. 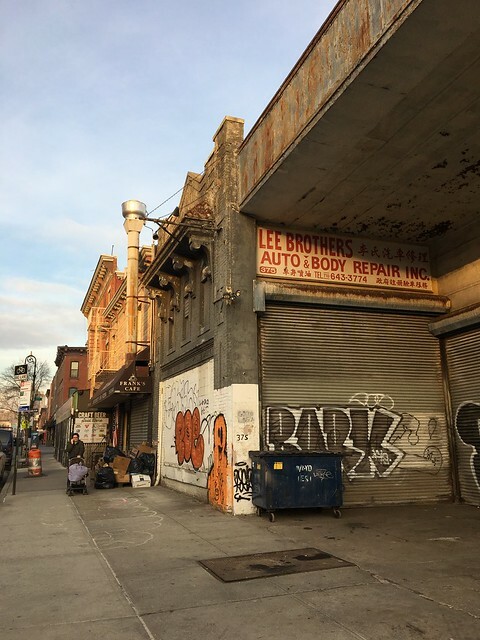 As a 20 year resident, I can say that I’m not suprised- I’m sure the Lee Brothers are going to do very well financially off this deal (like the owners of BookCourt, I can’t blame them)I wish they would’ve kept up the property while they were in business. Frankly, it was turning into an eyesore. What i do welcome is having a bit more activity in the evening. The added housing and commercial will liven that block up a bit. It could be very desolate getting off the train sometimes. FYI, within the span of an hour last night around 8:00pm there were two confirmed robberies via the Citizen App. One at knifepoint on Court and 2nd place and another at gun point at Hoyt and 3rd. In retrospect, maybe the building across the street was a blessing in disguise. The scale is so awful that it mobilized the neighborhood to get the 50 foot height restriction. I hope the developer creates a building that also fits the neighborhood contextually. Eckard originally proposed a white stucco building that looked like it belonged in a strip mall in Florida. Frank's will stay put, right? anonymous at 12:05 pm - citizen app? you mean the app that encourages ordinary citizens to surveil other citizens that used to call itself VIGILANTE? the same app that despite its re-branding, police departments go out of their way to mention that they don't endorse it? how is it? and is it accurate? do you feel safer with it? Sitting on top of a subway stop, its absurd that this has to top out at 50 feet - don't need a high rise, but a couple more stories makes a lot of sense here. The quality of the construction matters more than anything, so hopefully they will put something up with decent materials and design, not the stucco over foam blobs that developers try to get away with. Anyone who yearns for Carroll Gardens to have more taller buildings should really consider relocating to that borough across the East River - I heard they have plenty of super tall buildings to delight people who enjoy living in that sort of environment. Long Island City in Queens is another option too. Not everyone wants to live in the US equivalent of Shanghai - thank you very much. Unlike anon 1:22, I never felt that the building on the northwest corner was too tall. The subway viaduct opens up the entire intersection and (imo) allows for a lot of density at what is clearly a gateway to Carroll Gardens. Like several of the other commenters, I think it is a missed opportunity to construct such a low-scale building. On the other hand, like JMB, I have fantasized about a beer garden! I'll feel the loss of the building and I'm sorry to see it go. I am sorry to see a long-time small family business go. I am tired of the only ideas for business ventures in the neighborhood being bars, restaurants, spas, home decor. Enough already. I would like to support small industry of necessary goods, instead of supporting chain drug stores and big box stores. Nor am I eager to see tall construction. 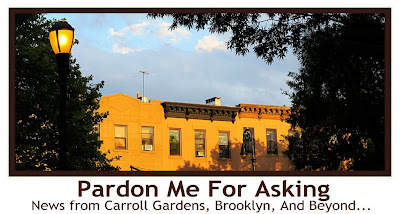 The sound level from air conditioners in this neighborhood has made beautiful Carroll Gardens a much less quiet and unique place to live. To those who wish for taller buildings, why? Do you live on the adjacent block and somehow wish for a darker apartment? Do you hope and pray for mountains of garbage and recycling to be piled against your car? If you’re an owner, do you pine away for months of vacancies in your rentals? Do you listen out your window and think it would be improved by some more giant a/c units? If it’s simply for the ‘beauty’ of tall buildings, can you show me one new tall building that is interesting or beautiful? Does a tall building somehow make a neighborhood more New York? Do you wish the Carroll Street subway platform was more crowded? This is not Manhattan, please stop wishing it was. I want taller buildings because it will make the world a more just and fair place, and contribute to the betterment of the environment. Now, those things will not happen LOCALLY, and such is the tragedy of the commons. I readily admit that taller buildings, or even towers, in Carroll Gardens or Cobble Hill would make MY way of life more difficult. I readily admit that less sunshine would not be desirable for ME. I readily admit that more crowded trains is not good for ME. But public policy should not be made based on what is best for ME, or my neighbors. It should be made based on what is best for the majority of people. And, for the majority of people, more housing units in New York City would result in, as you admit in your comment, a lowering of rents. It would relieve development pressures from farmlands and natural areas in the exurbs. It would result in higher ridership of the MTA, giving transit more money. So, I can admit that I will advocate against MY own best interests, for what is best for society at large. Towers on Smith Street would make it harder for me to park, would make Carroll Park dirtier and more crowded, and would make the neighborhood darker. But the benefits to those living there, and to society at large, would largely outweigh my negative effects. Can you say you would sacrifice your own quality of life for others? Curious that some of the readers are lamenting that it's not more than 50ft. tall. I'm an artist....yes, they still exist in carroll gardens, and the last thing our street needs is another 70+ tall building. Go to downtown Brooklyn for that....we don't need it here!